The 15 largest stocks with exposure to the tourist industry on SGX averaged a total return of 2.7% in the YTD, compared with average total returns of -10.7% in 2018. Genting Singapore and Singapore Airlines, the two largest players within this group, have also gained 10.8% and 3.5% respectively in the YTD. Between Jan and Nov 2018, Singapore had more than 16 million international visitor arrivals, reflecting a 6.6% growth from the same period in 2017. Despite concerns over slowing global growth, Singapore’s tourism sector has enjoyed consistent growth in international arrivals over the past four years. Visitors from five of the largest international visitor-generating markets, namely China, Indonesia, India, Malaysia and Australia, make up 56% of total arrivals and 45% of total tourism receipts. In 2019, these key markets will remain primary revenue drivers for Singapore’s tourist industry. SGX lists 15 stocks with significant exposure to the tourism industry and which have a market capitalisation of more than S$200 million. Among them are property developers that manage serviced residences, hotel operators, transport operators, as well as companies that run gaming, leisure and recreational facilities. The two largest stocks within this group, Genting Singapore and Singapore Airlines, gained 10.8% and 3.5% respectively in the 2019 year-to-date. In February, Genting Singapore is expected to announce its FY18 earnings while Singapore Airlines is expected to unveil its fiscal third-quarter earnings for FY2019. 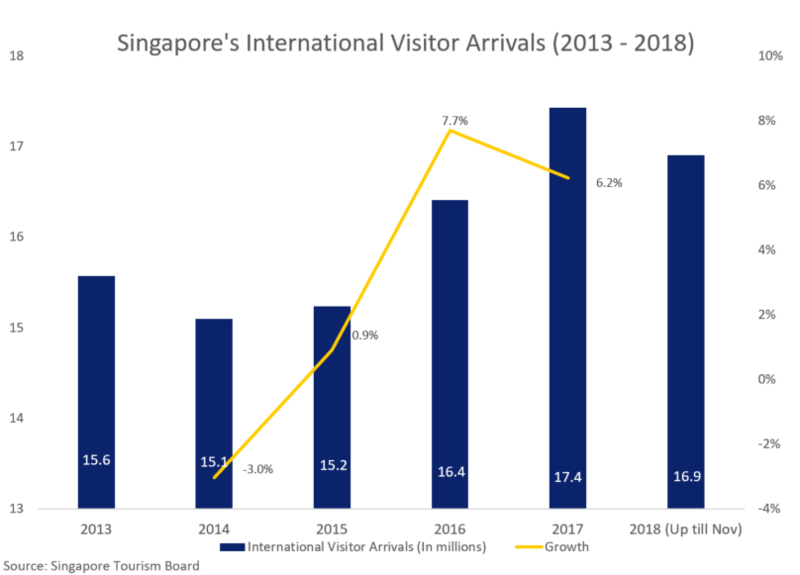 Between January and November 2018, Singapore had more than 16 million international visitor arrivals (IVAs), reflecting a 6.6% growth from the same period in 2017. This was preceded by a 6.2% year-on-year growth over calendar years 2016 to 2017. While global growth is expected to continue to decelerate according to the International Monetary Fund’s (IMF) recent projections, consistent growth in visitor arrivals has brightened the outlook for the domestic tourism industry. 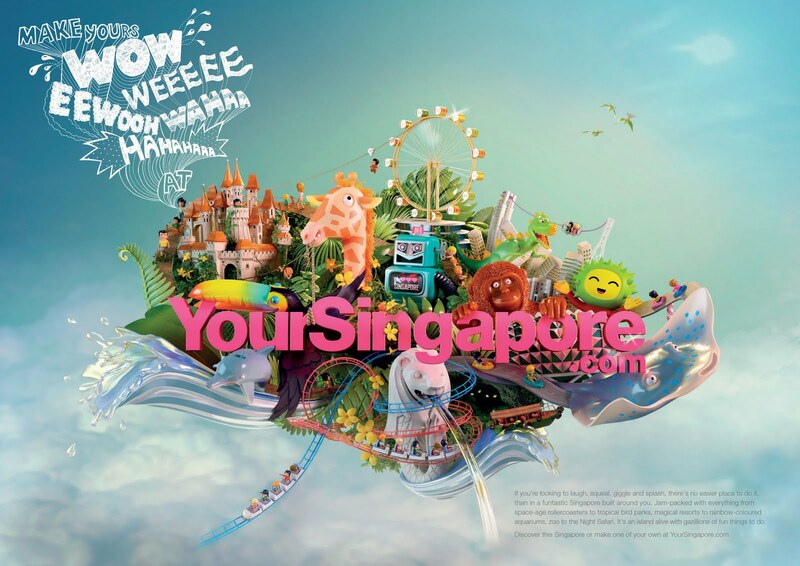 According to the Singapore Tourism Board (STB) report for Q2 2018, there were up to 9.2 million international visitor arrivals with total tourism receipts amounting to S$6.6 billion in the first half of 2018. Visitors from 5 of the largest international visitor-generating markets, namely China, Indonesia, India, Malaysia and Australia, make up 56% of total IVAs and 45% of total tourism receipts (excl. sightseeing, entertainment and gaming). In 2019, these key markets will remain primary revenue drivers for Singapore’s tourism industry. Tabled below are the 15 largest stocks with exposure to the tourism industry on SGX, sorted by market capitalisation. These stocks averaged a total return of 2.7% in the YTD, compared with average total returns of -10.7% in calendar year 2018. This brings their three-year total return to 20.8%.